Travel to ancient Egypt and the tomb of King Tut in the new Wishing Cup slot game from Rival Gaming. It's just been added at Slots Capital and Desert Nights. Both of these fine online casinos are giving an up to $500 casino bonus. You can also claim a $10 Freebie! Wishing Cup has expanding wilds, free spins and a secret passage symbol. 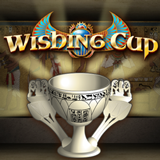 The Wishing Cup slot from Rival Gaming will take you back to the splendours of Ancient Egypt. The original Wishing Cup was a lotus-shaped Alabaster chalice belonging to King Tut inscribed with royal wishes. Landing the Wishing Cup symbol on this exciting new slot and King Tut is reborn to help winning wishes come to life with Wild symbols. Bet from $.01 to $2.50 per spin and win jackpots up to $5000. Meanwhile, the casino bonus Advent calendar at Slots Capital and Desert Nights continues until Christmas Day with daily Christmas presents hidden under each date on the calendar -- bonuses up to $1000 and lots of freebies. Slots Capital Casino and Desert Nights Casino both offer a wide selection of unique games from Rival Gaming, including the Christmassy Snow Wonder slot, in their download, instant play, and mobile casinos for smartphones and tablets.